WASHINGTON, D.C. /The Hague (18 December 2017 ) A new research study from the Fair Labor Association (FLA), iMentor and the Stop Child Labour Coalition (SCL) confirms the substantial prevalence of child labour in footwear production in the city of Agra, one of India's primary centers of domestic and export production of leather footwear (around 25% of the Indian export of shoes is being produced in in Agra). 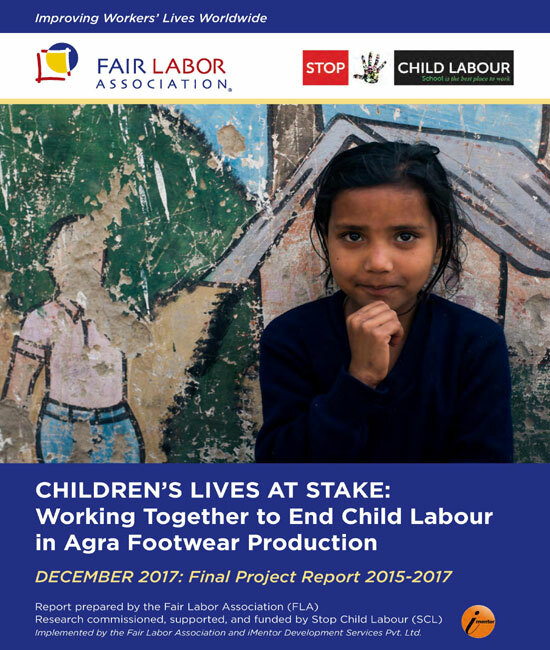 The research report ´Children's Lives at Stake - Working Together to End Child Labour in Agra Footwear Production´ is being published today. To reduce the incidence of child labour in Agra, the FLA and SCL propose collaboration in Agra between buyers, suppliers, government, civil society, and communities to establish a "Child Labour Free Zone." In creating a ´Child Labour Free Zone´, participants focus not on a specific industry sector, but on eliminating all forms of child labour from a specific geographic area, whether children are working to produce footwear, in the tourism industry, or in some other sector. To support this endeavor, the report also includes numerous recommendations for how buyers and suppliers operating in Agra can collaborate to build more responsible and transparent supply chains free from child labour. UNICEF works in 190 countries and territories to protect the rights of every child and has a concern that out of every 10 stunted children in the world more than 3 are from India. 48% percent children under 5 years of age are stunted due to chronic under-nutrition and tribal areas have the poorest nutritional status on almost every measure primarily due to undernourished mothers. UNICEF called for proposal to map the community platforms in the tribal regions that have the highest potential to undertake nutrition intervention with mothers in the communities. The study was undertaken by iMentor in the District of Bastar in Chattisgarh and Koraput in Odhisha, and Jharkhand by Ekjut. Conducted between July 2014 and March 2015, an exploratory mix-methods design was adopted (review of coverage data and government reports, field interviews and focus group discussion with multiple stakeholders and intended communities) to assess coverage of women's nutrition services. A capacity assessment tool was developed to map all types of community collectives and assess their awareness, institutional and programme capacity as a funded stakeholder for delivering women's nutrition services/behaviour promotion. 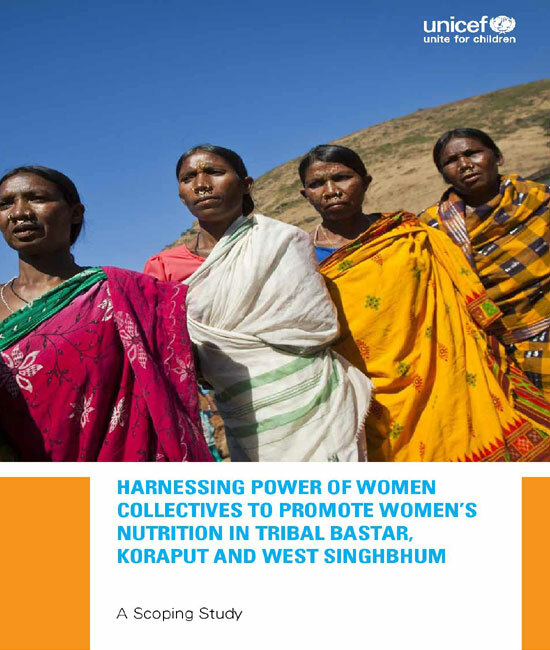 Amongst the 18 different types of community collectives mapped, Self Help Groups (SHGs) and their federations (tier 2 and tier 3), with total membership of over 650,000, emerged as the most promising community collective due to their vast network, governance structure, bank linkage, and regular interface. Nearly 400,000 (or 20% of women) in these districts can be reached through the mapped 31,919 SHGs. SHGs with organisational readiness for receiving and managing grants for income generation and community development activities varied from 41% to 94% across study districts. Stakeholders perceived that SHGs federations managing grants from government can be engaged for nutrition promotion and service delivery and SHG weekly meetings can serve as community interface for discussing/resolving local issues impeding access to services. It was concluded that Women SHGs (with tier 2 and tier 3) can become direct grantees for strengthening coverage of women's nutrition interventions in these tribal districts/pockets, provided they are capacitated, supervised and given safe guards against exploitation and violence.